send it to us!! We would certainly appreciate it! He shows signs of being the kindest, warm hearted dog I've ever been around. Although he's teething, and BITING everything (including my nose and ears lol), he listens, and makes eye contact and you can tell he aims to please. He is absolutely growing like a weed, and Danni and I are trying to photo document his life stages as best we can. I took him into tractor supply with me yesterday to pick up a few things, and put his blanket that he rides on in the car, in the bay of the cart. He sat patiently and quietly as many distractions and people ohhh'ed and ahhhh'd at his handsome good looks :). He's been so easy to cope with, deal with, and train (the little we've worked on this early). Danni and I are absolutely IN LOVE! So THANK YOU for all you do. Your efforts to provide the best quality and most wonderful animals to their forever homes has not gone unnoticed! Attached is a recent picture of Mia who will be 7 in July. She is doing wonderful, she is the most loving dog & very protective. I just took her to the vet for her annual checkup. Ok, the vet said : " he could not believe that she was 7 " (looked younger), she is in excellent shape, hind legs & hips were strong, blood results were in normal range as they should be. Eyes & ears clear, beautiful color & coat. Temperament was great. 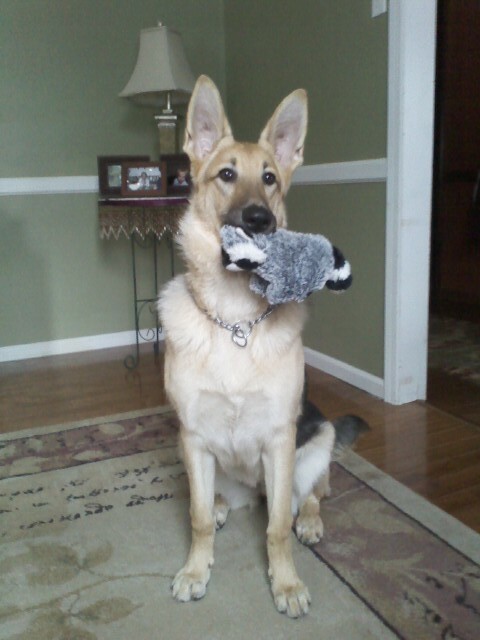 Also, I still hold Greta, our 1st german shepherd near & dear to my heart. Yes she crossed over the rainbow bridge, but I know she is in a good place. She is not forgotten. Mary & I just want to say thank you. Thank you Kellie! He had a good birthday :) sorry for the delay! He's grown up to be one of the sweetest and best natured dogs I've met or owned. I attached pictures from a hike a couple weeks ago. Hope this find you well! Thank you again! Looking for that special animal to fill your life with laughter, fun and love? GSD from the Mintern Family and that is exactly what they are, a loving, caring family, raising quality healthy puppies. Our hearts were broken hearted when our beloved Tasha became ill and died, and we then decided not to get another animal. just hang out with finally sank in. On July 11, 2013 our Miss Sophie- the southern belle was born (Smoke and Danni) litter. She is a beautiful puppy who loves long walks, snowball fun and playing with as many sneaky toys as possible. Here are just a few pictures of our Miss Sophie. As you can see she's just the most beautiful pup their is. AND she is Tasha's niece. I'm sure you sometimes see the pictures of Lexi on my facebook, but I just wanted to give you an update on her. 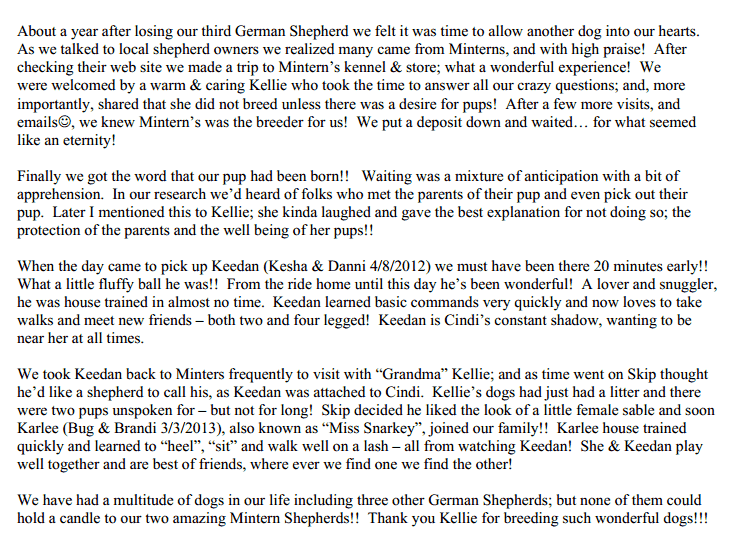 From the very first email that we received from Kellie, Sam and I knew that our long search for the right breeder was at an end. Her email was welcoming, full of information, and showed a true passion for what she does and an incredible love for her dogs. Despite her busy schedule, she was quick to respond to each and every question that we had regarding the GSD breed, the process of getting one of her pups, and happily telling us about the personalities of her dogs. When it came time for us to go and meet our boy, Baxter, everything was perfect. Kellie greeted us as friends, and Baxter was everything that we had hoped for, and even more! The very first night that he was home, he surprised us by sitting when we asked him to (we didn’t actually expect anything to happen). An even bigger surprise came when he asked to go outside. We had braced ourselves for weeks of cleaning up accidents in the house while we worked on house training. It turns out that we only had a handful of accidents and most of those can be attributed to us ignoring his requests to go out! He slept through the night without and whining or crying – only when he needed to go out, and we woke up to find a clean crate and a happy pup. As he got older, he has continued to amaze us. He is friendly and welcoming to nearly every person and animal that he meets, but has a good sense of when to be on guard. He sulks when people pass us by without acknowledging him, and proudly prances away when he gets to make a new friend. We hear over and over again how handsome he is, how he is the best looking shepherd that someone has seen in years. He is complimented on his calm temperament, and his intelligence, and how quickly he learns. I attribute ALL of this to Kellie’s outstanding breeding program and the love and dedication that she pours into it. Baxter is growing into an outstanding dog and companion, and we couldn’t have asked for a better pup. 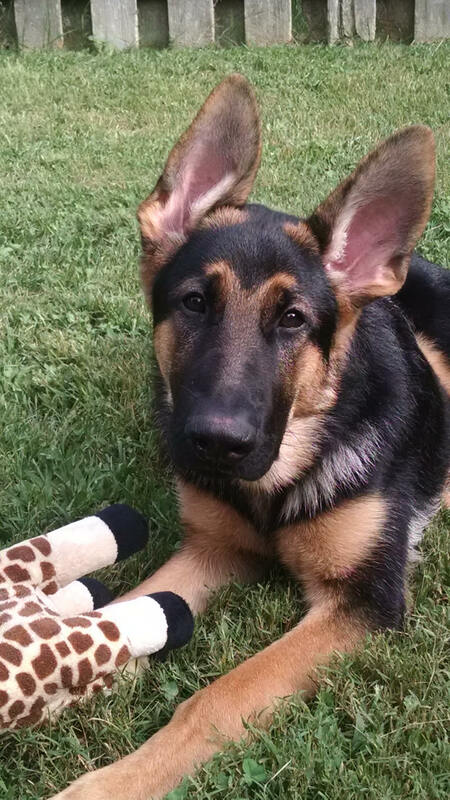 We look forward to the day when we can bring home a playmate for him – another GSD from Kellie, naturally! I hope things are well with you, Paren and the dogs, and that you're staying warm in this freezing cold weather! I just wanted to send you an update and some new pictures of Kyra. I graduated from school last spring and moved back home to live with my parents. Kyra has been excited to be reunited with LuLu (our golden) and they have become extremely close. I also recently found a full time job at a PR/Advertising agency in downtown Cleveland. Kyra has adjusted well to not having me around and I've been taking her to doggy day care which is her new favorite place. She has grown into such an amazing dog and I couldn't ask for a better companion. She is just so sweet, listens so well and never does anything wrong. She goes everywhere with me and we do everything together. Everywhere I go people compliment me on how beautiful and well tempered she is and they are always shocked when they find out she's only 18 months old! The most exciting news I have to share is that over the summer Kyra received both her Canine Good Citizen certification and her Therapy Dogs International certification and is now a therapy dog! She loves going to visit nursing homes and does really well with it! Thank you for helping make it possible for me to have such an amazing dog. She is everything that I wanted and I couldn't be luckier. So many of my friends have dogs with so many issues or vices and I can honestly say that Kyra has not one bad thing about her. I hope that when the weather gets nicer we can stop out for a visit so you can see what a great dog she has become! Well, it has been 8 months now since we brought our Leala home, and it has been the most wonderful experience I have ever had with a dog. We truly did not know what to expect with this being our first GSD, but we are in awe everyday of this wonderful animal that you provided us with. She is incredibly smart, and most of the time is willing to please. She loves people and other animals, and I can honestly say that I am very impressed with the temperament and the disposition that she has. I can take her anywhere and she is always on her best behavior. We never once had any issues with her being destructive or tearing things up. She crate and potty trained very easily and has just been a joy. She has become more than just a pet, she is a true companion. This can only come from quality breeding and we believe that you have done an excellent job with your dogs at Mintern's. Words can not express how great the entire experience has been for us from our first email to you to all of the updates on your website. Thanks Kellie, not only for the love and care that you give your dogs, but for the support that you give the families who own one of your dogs. Your level of understanding and care for your animals is unsurpassed. We recommend you to everyone and we know that when the time comes for our next GSD puppy it will definitely be a Mintern's puppy. 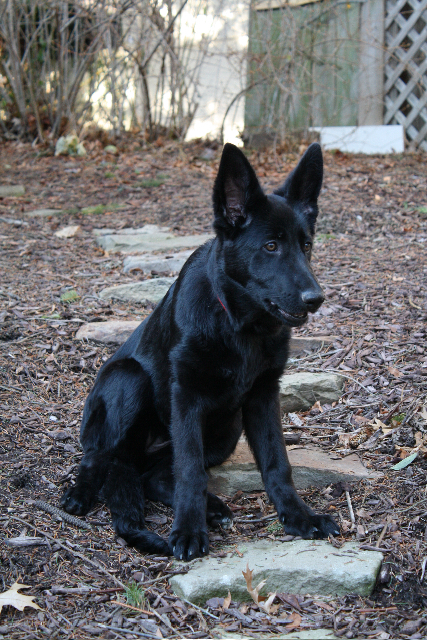 I wanted to take a few minutes to jot down what a wonderful experience it was getting our black GSD, Moxie, from Kellie and Paren at Mintern Shepherds. We knew we wanted to get a puppy for our family and had many wonderful emails with Kellie before we decided to visit the kennel. Our original intention was to get an eight week old puppy but in checking out the web site we saw that they had a 4 month old Black Shepherd from her summer litter. From the moment we walked into the store to meet our Moxie we were at ease and delighted. Kellie and Paren are so friendly and knowledgeable. Moxie was calm and very responsive, showing that Kellie had been working with her already. We fell in love! Since getting her home she has been a delight. Make no mistake, German Shepherd puppies are a lot of work, but Moxie is very intelligent and loving and genuinely wants to please. This is only possible through excellent breeding. As we take her out and about we get many comments on her luxurious coat and friendly, yet calm temperament. She was very quickly potty trained and even our 7 year old is very successful in training her. Best of all, we have gotten more than a great dog, we now have a wonderful friendship with the Minterns. Kellie really means it when she says you get her for life! 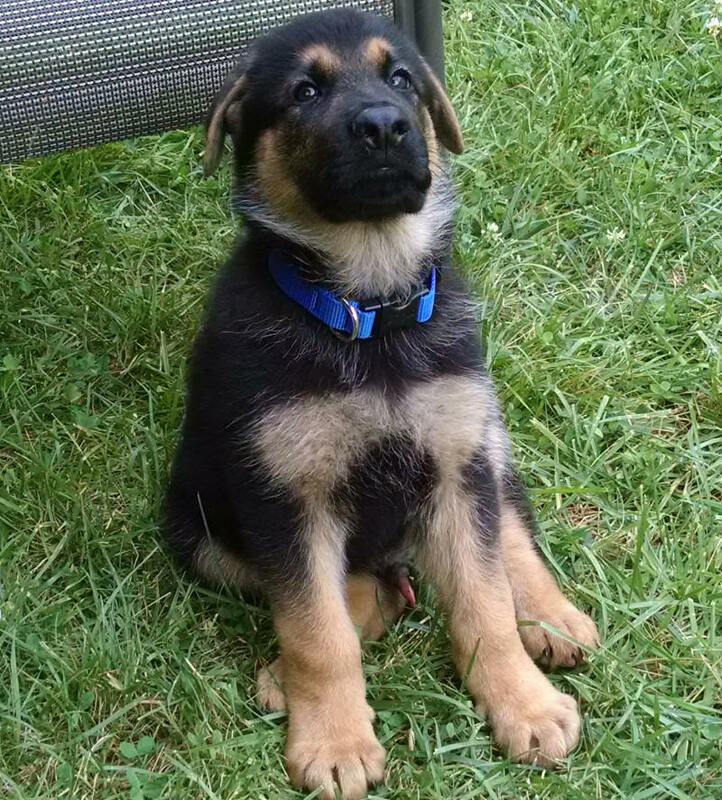 When we get our next GSD (yes, that has already come up!) we will most definitely go straight to Mintern Shepherds! We are writing to let you know our absolute, total satisfaction with doing business with you and your kennel in obtaining Bella. From the very first “Meet The Parents” visit through many e-mails and phone calls both before and after we picked Bella up, you have been absolutely fantastic to deal with. We knew we wanted a German Shepherd puppy, and did extensive research in search of the right breeder and kennel for us. While there were several kennels closer to us, we decided to go with your kennel based on what our internet research revealed. When we visited your kennel, we knew we had made the right decision. Your knowledge, dedication, and very obvious love for your dogs and what you do were evident from the very start. It’s been almost 5 months now that Bella has become a part of our family, and we simply cannot be happier. Bella is an unbelievably sweet and gentle dog. Her intelligence astounds us more every day. Such a dog does not happen by accident. It comes from breeding, environment and love, something we’ve learned your kennel has in abundance! We are already planning on getting Bella a new brother or sister. One thing we know for sure is that it will come from Mintern’s German Shepherds. Thank you for all you’ve done for us, Kellie! I'm sure you're busy with the kennel and upcoming litters but wanted to update on Jack. He's been a great guy, one of the best dogs I've had and definitely the best/easiest puppy to bring up. Great temperament, always happy and (almost) always wanting to please. His ears have been huge and getting bigger ever since we got him and they haven't fallen which has surprised me, always erect. I haven't weighed him in a few weeks, but he's probably reached 40lbs by now and just keeps growing. We just got back from a 16-day 8,000 mile road trip across the country with Jack and he was wonderful the entire trip. Before getting Jack, I would never have imagined any dog traveling so well, especially not a 4-month old puppy. The evening before the trip he saw us loading the car to his extreme delight (he loves road trips), and when finished with the final preparations would not settle down to allow us a few hours sleep before we left so we finally gave up on sleep and just left. When we opened the door to leave he bolted for the car and sat beside the car waiting to go. He was perfect, from long car rides with stops every few hours for him to relieve himself and stretch his legs, to sleeping in a tent almost every night to the few hotel stays we made, he was perfect. He never once wanted anything else than to be riding in the car or running on-leash in a park, no matter how many hours in a day in the car, and we made a couple extended 20+ hr non-stop drives other than for bathroom/exercise, he enjoyed the entire trip. I'll have to email you a few pictures of him taken along the way, but he's been to Bryce Canyon, Grand Canyon, Arches, Zion, the Pacific ocean, and a number of other very cool places around the country. He is fearless, there were a number of new experiences for him along the way and never did he shy from them, always confident, yet curious. We had a number of other campers near our camp sites along the way comment on how well behaved, handsome and alert he is. He kept a quiet but alert eye on every person near us while camping but loves strangers when introduced. Still a puppy and he does some hilarious stuff at times, but he's always great fun to be with. You're kennel produces some wonderful animals and I've been very impressed from the beginning. I would not hesitate to get another GSD from you and your kennel and hopefully in a year or two might be able to add another to our family. Attached is a photo of Sable from last week. I do not remember her parents name but she was born on 1-02-01. She is the one of the greatest shepherds we have had. Her nickname is “Baby” because that’s what she is! She is the gentlest, most easy going dog. There are not enough words to describe what a terrific dog she is. Everyone loves her no matter where she goes. She’s just that kind of dog! I am sending this email on behalf of my mom. She has always wanted to bring Sable back over to show you her. As for my family and I, the next time we get a Shepherd, it will definitely be one of yours. You have a great passion for these dogs and it shows with your breeding and care for them. We recommend you to everyone. Hope this find you and Paren well. I just wanted to check in because I have been thinking of you a lot lately. I am truly glad I found your website. Other wise we wouldn't have Reggie. I look at him every day and say WOW, he is ours. He is funny, loving and very much his own personality. Never had a love like him. He is truly a one of a kind. He is two now. It seems like yesterday I awaiting his arrival home. Going to visit him with you. And getting the house ready for him. He came in and took over as if he knew he was meant to be here. Never fearful or unhappy. He is our love. I just wanted to thank you for doing all you do for these precious pups. Other wise we wouldn't get the joy and love we do from them. Every time I look at him, always happy and loving life, I know I owe that to you for starting his life out so well with love and kindness. Now it's just my job to make sure he stays that way. Thanks Kellie again for all you do. God sent us an angel just when we needed one. And that's you. Love and God Bless to both you and Paren. I've been meaning to send you some updated pictures for a while now, but keep getting sidetracked. These pics are a couple of weeks old, so you know Gideon is even bigger now. 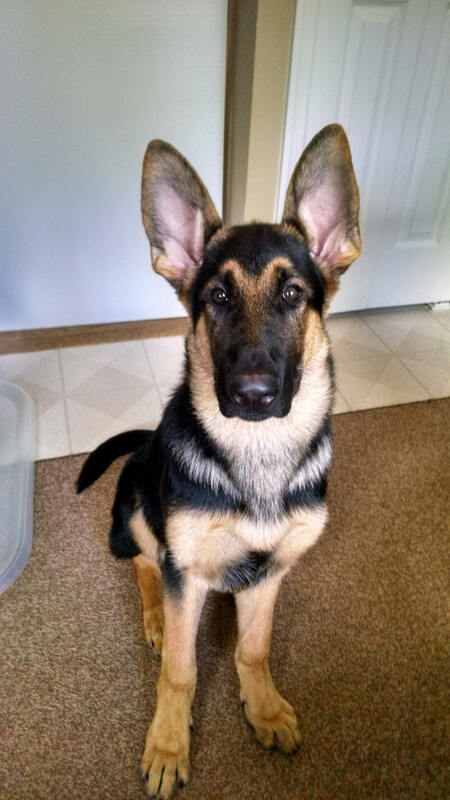 As I'm sure you already know, he's 7 mos old and still growing into his ears. Gideon is such a joy! We attended puppy class that started the end of March. He not only graduated, he got put into the intermediate/advanced class. We are both REALLY enjoying it. Class is every Saturday (no class in July) and then after class we all go to a local restaurant with the dogs and sit outside to have lunch. Its an AWESOME social experience for the dogs. He does so well, that the instructor wants to test him in a couple of months for the Good Canine Citizenship certification. Last month, I took Gideon to my niece's graduation and exposed him to a bunch of kids and loud noises. He did great! I even allowed a toddler to crawl on him a little, being careful that he didn't snip at the child. He did wonderfully! He has a great temperament. He still gets frightened every now and then, but that's to be expected. Its just really hard not to laugh sometimes, cause it can be quite humorous. Everyone who sees Gideon, just loves him. In fact, I've recommended several people to your website. Not sure if any of them actually contacted you, but I'm sending them your way. Well, I better get back to work, but wanted to get these off to you. I hope all is well on your end! I am now living in Arizona, but want to let you know that Bellagio is doing well at home in Ohio with my family. Being so far away, it is nice to visit home and have her greet me just as if we never missed a day together. 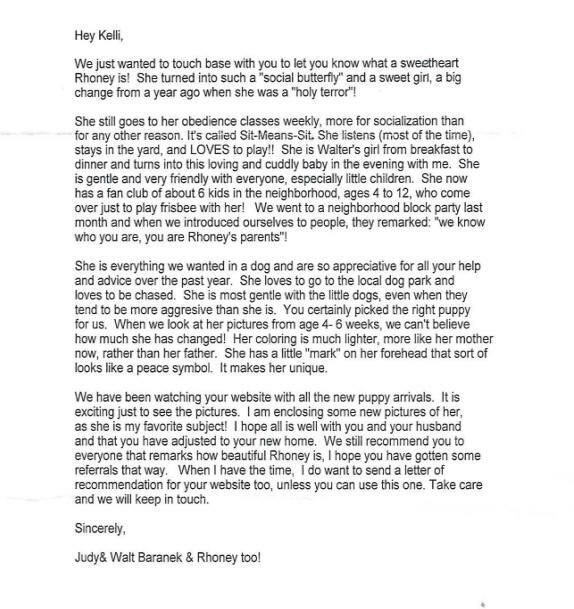 Feel free to use this letter for your reference page…because the decision to add her to the family has been wonderful. She is getting a little gray around the nose, as she is 5 years old now, but she still acts like a puppy when playing Frisbee. I was originally concerned that by living in Arizona she would forget who I was and bark upon my return home. My concerns were without merit, because the 3 or 4 times a year I return, she runs right to the door to greet me. She has built a strong bond with the rest of the family, and is very protective of my mom. I miss her very much when I’m away from Ohio. 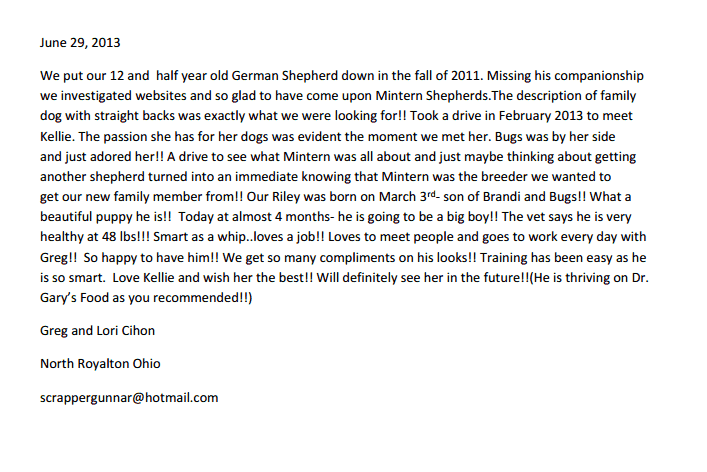 For anyone thinking about purchasing a puppy from Mintern’s…do it! The dogs are without a doubt, the most loyal and obedient friends you will find. The hard work, and years of QUALITY breeding, by the Mintern family will allow you to add a true companion to your family! All my best to the Mintern family and to the dogs and puppies running around the property. Once I have my house here in Arizona you will be hearing from me so I can get another GSD. Have a great day, and keep up the GREAT work! Keiko loves to be where the action is. She is an excellent babysitter to our 3 children and a wonderful watchdog. She is the most gentle dog yet she just has the keen sense to "know" when something isn't right. Keiko has always accepted any new pup or kittens into her home. She loves the new "babies" to play with. We recently bought some chickens and Keiko will just spend the afternoon watching them walk past her. She walked into her new home and never had one accident. She constantly amazes us & those who meet her. People actually stop us on the street to rave about her gorgeous coloring. 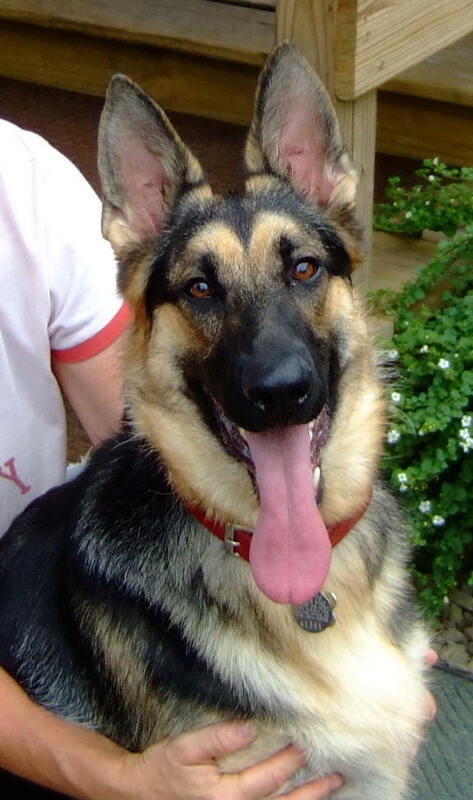 We are confident that her wonderful personality and intelligence is a direct result of her breeding & the loving home she was born and raised in before we adopted her. My daughter was just over a year old when we took her along to Minterns Kennel and one of her first words besides Doggie was BUBBA!!!! Keiko was a few months old when we adopted her. She is a beautiful Red Shepherd. Kellie was so honest and open letting us tour her kennel, see all the parents and even walking us into her home to talk and go over GSD information. Of course we couldn't leave without a BUBBA Candle!! After meeting Kellie, Paren and the dogs, we knew immediately this was the breeder for us. 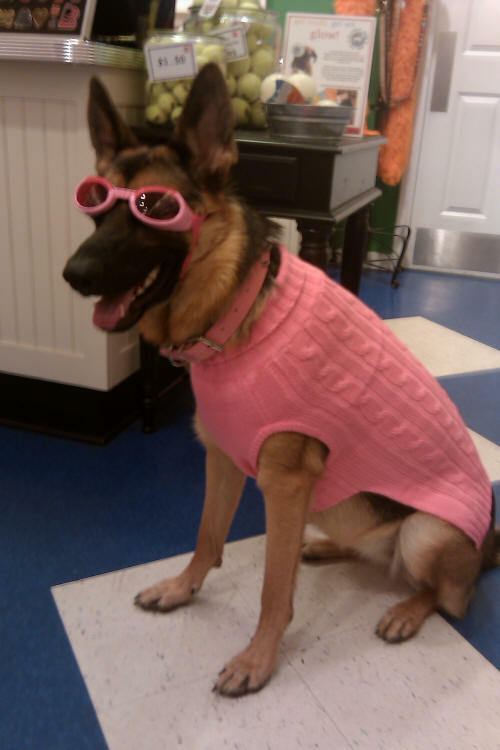 Kellie lets you feel like you joined her GSD family! Kellie has always answered any emails and phone calls, no matter what questions we had. Our family went through a very rough time and she was there as a friend as well as a true breeder willing to take back the puppies we bought from her when we thought we couldn't keep them a without a question. As hard as that was we knew she'd find our puppy a great home. Time has passed and things are looking up. We hope to one day add another Mintern GSD to our family. Kellie is not just a breeder. She is an Angel. Her husband Paren is one of the nicest people I know. We wouldn't think of going anywhere else for our dogs! I would recommend that ANYONE wanting a German Shepherd should get a Mintern puppy! Mark & Leti Schooler and Family. I just wanted to let everyone know about my experience with Mintern German Shepherds. Kellie and Paren are truly wonderful people who care very much about their dogs, puppies, and ALL who take one of their precious babies home. The first time I met Kellie I felt like I'd known her my whole life. She and Paren take you through every step of your puppies life; from meeting the parents, grandparents, etc. When she says you have her for life she really means it. She will answer any questions, and if you have a problem she will always help. The kennel is beautiful, and all of the dogs are healthy and happy. Sabrina, my baby, ( Born Oct. 3, 2007--to Gizmo and Cherokee) is just a wonderful and intelligent little girl, not to mention beautiful. We love her very much and are so glad to know Kellie is always there. Thank You Kellie! I wouldn't go anywhere else for a German Shepherd Dog. 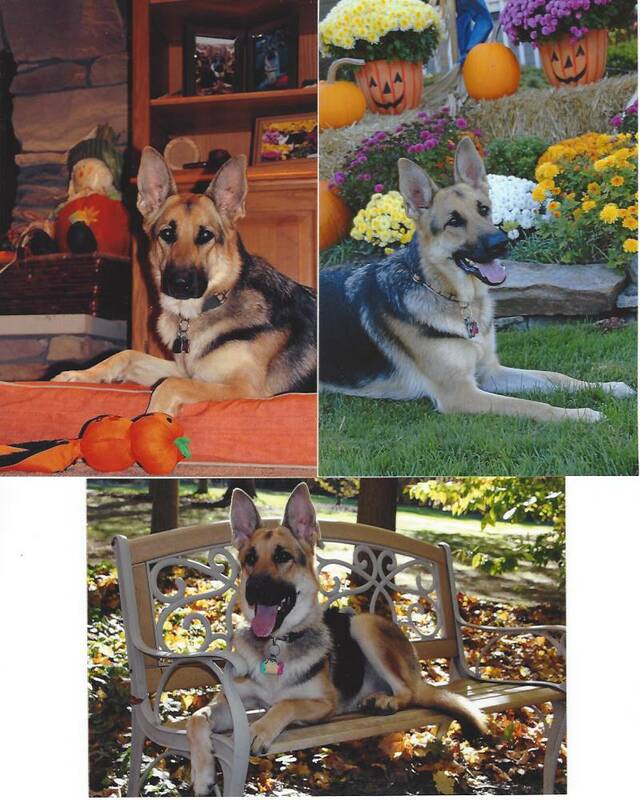 Our dog "Bella" was born on October 3, 2007 (Cherokee and Gizmo's litter). We could not be happier! It is such a joy to have her in our family! Bella was very easy to train (you can just see the intelligence in her eyes). She is so gentle, friendly and well-mannered when we have guests, but she is also a great watchdog, too! She loves to sit on our deck where she can keep an eye on what's going on around the neighborhood. It is obvious that she is extremely well-bred. We had such a great experience, we wouldn't even think of going anywhere else for our dogs! I would recommend that ANYONE wanting a German Shepherd should get a Mintern puppy! 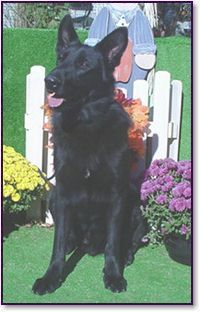 Attached is a photo of Hunter our solid black German Shepherd from Mintern's. Hunter is pictured here with our youngest daughter Sophie. As the parents of three small children we choose our German Shepherd not just as a family pet but as our family protector. Hunter is very patient and loving with our children, he is a member of our family and he gives us a great sense of peace and security. He sees our children as his children and is their loyal companion and guardian. Hunter is always friendly when guests come over to visit but no one is going to enter uninvited. If you are looking for a top of the line German Shepherd please go to Mintern's. Their dogs are expensive but they are worth it. Mintern's breeds dogs for health, beauty, strength and personality. 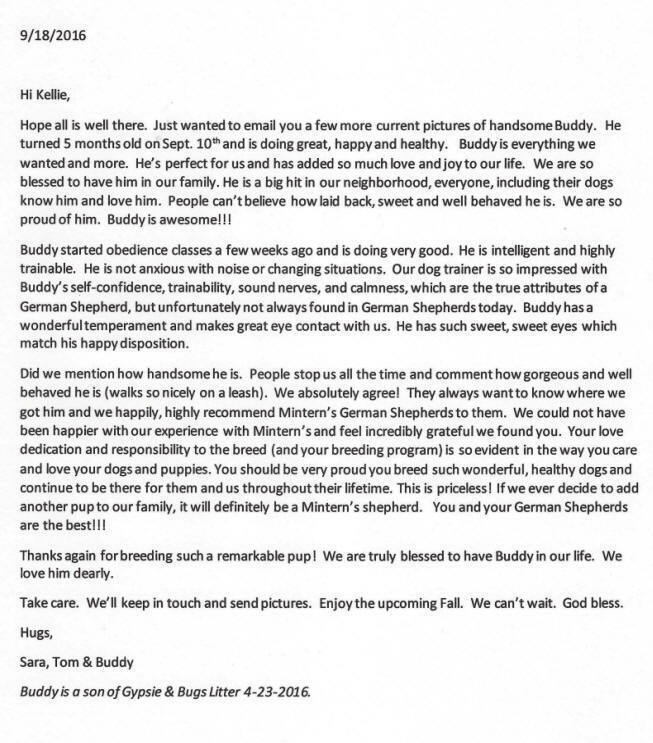 We sent our doctor to Mintern's for their German Shepherd and they could not be more happy with their dog. 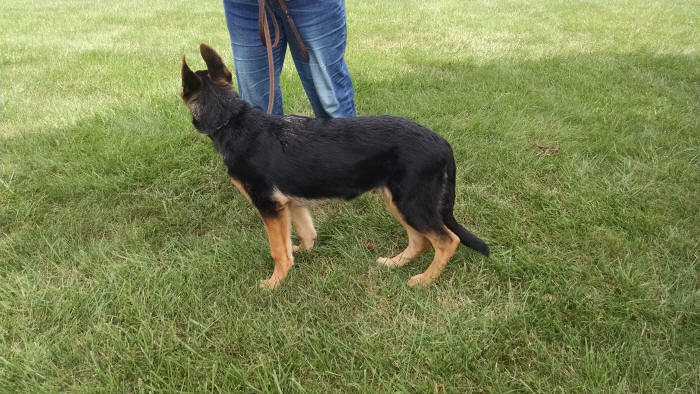 Without a doubt Kellie and Paren Mintern breed the best German Shepherds in Ohio please visit their kennel and you'll see what we mean. 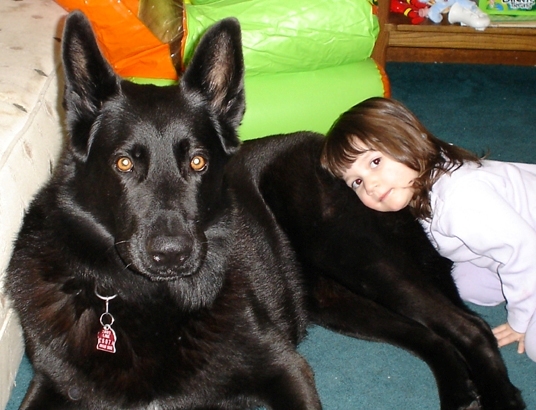 When we lost our beloved Shepherd, we were convinced no dog could ever take her place. However, we also couldn't envision our family without a dog, and knew we wanted another German Shepherd, as we love the breed. We began an extensive search to find a breeder who could best fit our needs. We were continually disappointed until we found Kellie. We liked the fact that she was a small breeder, and loved the idea of being able to visit with the parents and even the grandparents of the puppy we would eventually choose. Kellie's well-designed website provided us with more than enough information about her, her beliefs, and the dogs she provided. Furthermore, her attention to the smallest details was assurance enough that any puppy we got from her would be healthy, even-tempered, and intelligent. Our first visit to the Mintern kennels was merely to inspect the kennels and look at the dogs. However, we immediately liked and trusted Kellie, and loved the dogs we saw there. We ended up adopting a curious little male puppy whom we promptly named Jag. Jag has exceeded our expectations. He is a sweet-tempered dog who gets along well with people and other animals. We never worry about him--he loves everyone, and is very gentle despite the fact that he is huge. He is definitely a wonderful addition to our family, and we can't imagine our lives without him. No dog could ever replace our first Shepherd, but Jag has proven to be, in all honesty, an even better companion. He is loving and sweet, loyal and fun-loving. In short, he has fulfilled all of our hopes, and we truly can't imagine our family without him. 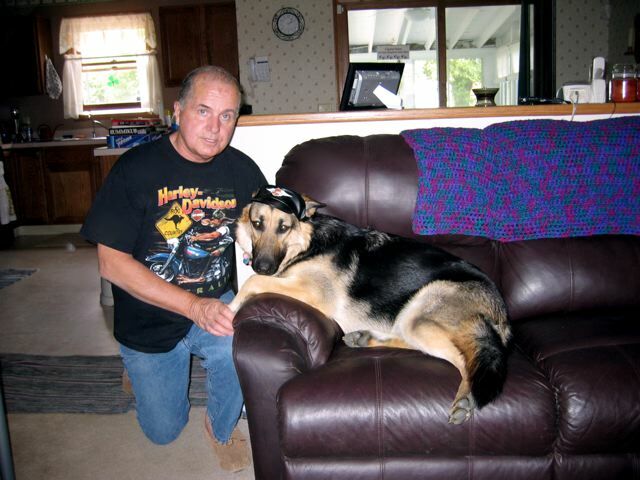 If you are looking for a high quality dog--one who exhibits the best of the German shepherd breed, then you can do no better than to go directly to Kellie for one of her excellent puppies. We cannot thank her enough for providing us with our beautiful, sweet natured, loving Jag. We purchased “Sweet Sadie Lou” in November 2006. Sadie is the daughter of Gizmo and Miss Polly born September 18, 2006. We love this dog!! I have done Golden Retriever Rescue for quite a few years. I’ve owned three Goldens and just love the breed. My male retriever passed away near Christmas of 2005. We were heart broken. It literally took a year for me to become ready again for another dog. My husband said that he wanted a German Shepherd. My profession is research. So believe me when I tell you I researched EVERYTHING I could find on German Shepherd breeders! 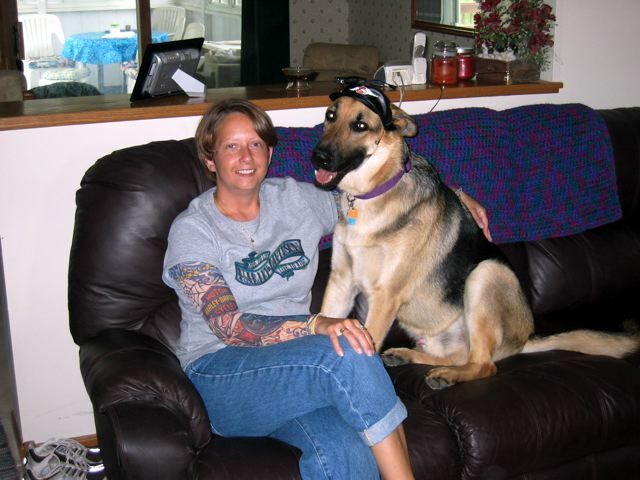 I came across Kellie’s website and was so impressed with the love Kellie had for her dogs. It didn’t seem like a business to her but instead more of a life’s passion to care for her dogs. I emailed Kellie and asked her a million questions! She answered every question I had and told me to feel free to call her! When a litter is born, Kellie puts a colored ribbon on each puppy then she photographs it and posts it on her website. The puppy that had the hot pink ribbon caught my eye and I would go to the website every week and look at her new picture. I was still struggling about getting a German Shepherd puppy so I asked Kellie if we could come out and visit the kennel and meet them. I also let her know that I was already in love with the hot pink ribbon puppy. We drove from Toledo about 3 ½ hours to visit. When we arrived we were so impressed with how clean and well kept the kennel was. Kellie and Paren took us out to the kennel and brought out Gizmo (dad) and Miss Polly (mom). Both dogs were beautiful and so well behaved. Kellie then brought out the puppies. There were no ribbons on them, but with just one look I knew which one was my Sadie! We held her for a long time and asked another million questions. We decided that we wanted to take Sadie home. Kellie then asked us a million questions to make sure we were a good match for Sadie. I loved that she was more concerned with finding the right home for her puppy than she was in selling the puppy. After Kellie was comfortable with us and we were comfortable with Kellie, she brought us in the house to do the paperwork. Bubba was in the house and he played with Sadie in the kitchen as Kellie explained in detail about vitamins, food, grooming, health, etc. for Sadie. We really felt comfortable with Kellie. She assured us that she was just a phone call away if we needed anything. Sadie sat on my lap the whole way home! So sweet! Over the past ten months I have emailed Kellie a number of times with additional questions. She has always returned my emails quickly and answered everything thoroughly. We are going on vacation in August and Sadie is coming back to board at Mintern Kennels. I couldn’t think of anyone better than Kellie to leave our precious Sadie with than her. Sadie is an amazing dog! Sadie is very loving but protective as well. People constantly stop me and compliment me on how beautiful and well behaved Sadie is! Mintern shepherds are just wonderful dogs. I believe because they come from a wonderful place and from wonderful people! One of our greatest "purchases" was almost 6 years ago. Koby came to us quite by accident. We were looking for a black retriever like the golden retriever. I happened to stumble upon the Mintern webpage while looking at black dogs. 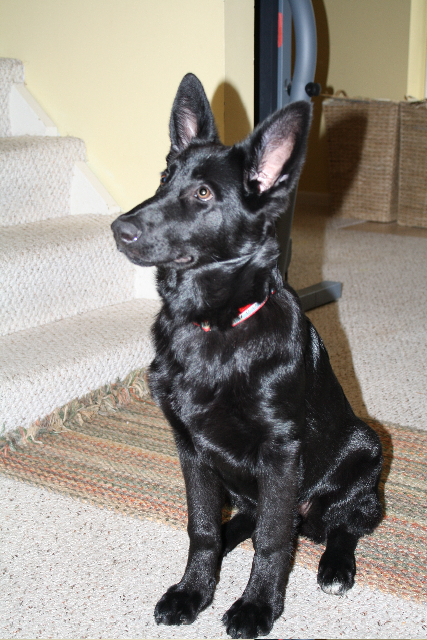 I had never seen a black German Shepherd and decided to take a look. Kellie had a beautiful litter from Cody's daughter, Nitty and Bubba. Koby was one of two females left (I do believe Kellie kept the other one). Koby has been so entertaining and fun to be around. She did get into quite a bit of mischief while she was growing into a fine little lady. She is very protective of me and my husband and of our yard, neighbor's children, the street, etc. You get the picture. The neighbor's children all love Koby and come to visit her all the time. One of Koby's favorite children is the granddaughter of one of our neighbors. When she comes to visit her Grandparents, she always comes to play with Koby too. Koby has had so many compliments we've lost count. So many people say how beautiful and well behaved she is. We get asked the same question over and over...what kind of dog is she? Most people think she has Lab in her. Koby will be six on September 15. She is only now starting to slow down...sometimes....HA HA HA!! I am so glad we found Kellie, any questions we had she was there for us. Getting Koby was the next best thing to having a family for us. (We have no children. )My husband thinks I treat Koby like a little queen. (Like he doesn't!) I have told many people about the Mintern Website and some may have checked it out because I look now and then when you sell your pups and see some from this area of Ohio. Kellie keep up the great work you do! We purchased our beloved baby girl 'Kaleigh' from the Minterns in early 2005. We took a great deal of time and research to find a reputable and responsible breeder. 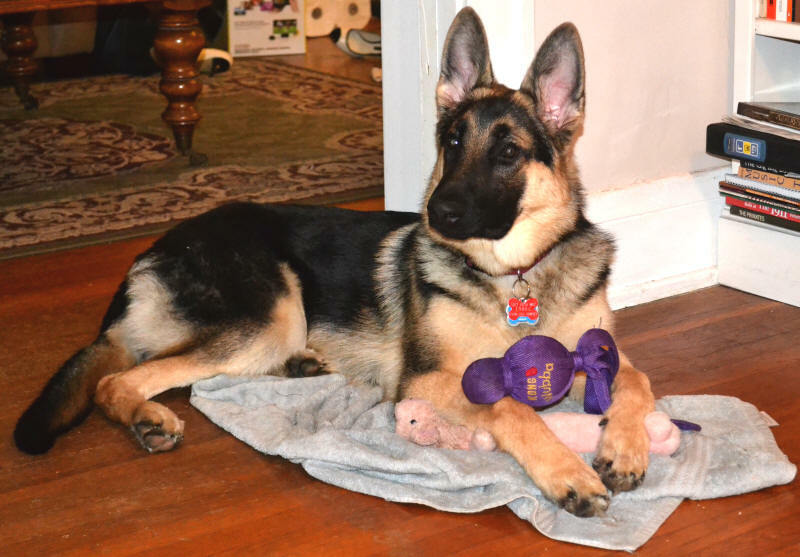 We talked with other shepherd owners, breeders, kennel clubs, and vets. We finally found the Mintern's through our vet since they use the same one. He couldn't speak more highly of Kellie and her breeding program. His high praise prompted me to call her. Kellie was more than willing to put us in contact with others who had previously purchased dogs from her. She spent a great deal of time explaining her breeding program and asking numerous questions to get to know us and what we were looking for. 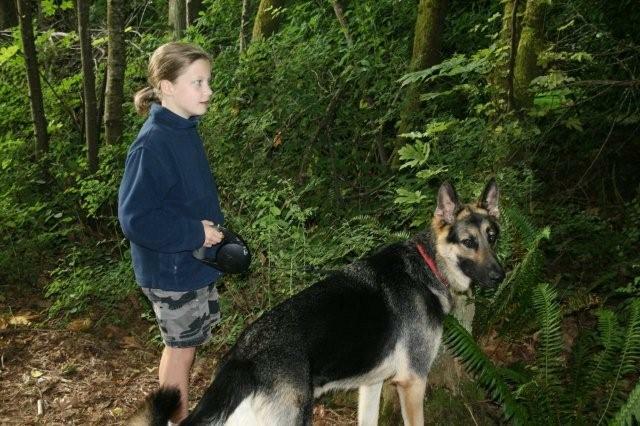 She was also careful to make sure a German Shepherd was the right breed for us. I had called many many breeders and did not find any others who were so careful to make sure that, not only did we get what we wanted, but to make sure their pup would be going to a good home able and equipped to care for it. We made several trips to the kennels to meet all of the wonderful kids that Kellie and her family raise and breed. They took a great deal of time to pair us with the type of dog we were looking for. All of the Mintern's have always gone out of their way to answer any questions we had openly. Kellie has been a constant source of information and learning about this breed. 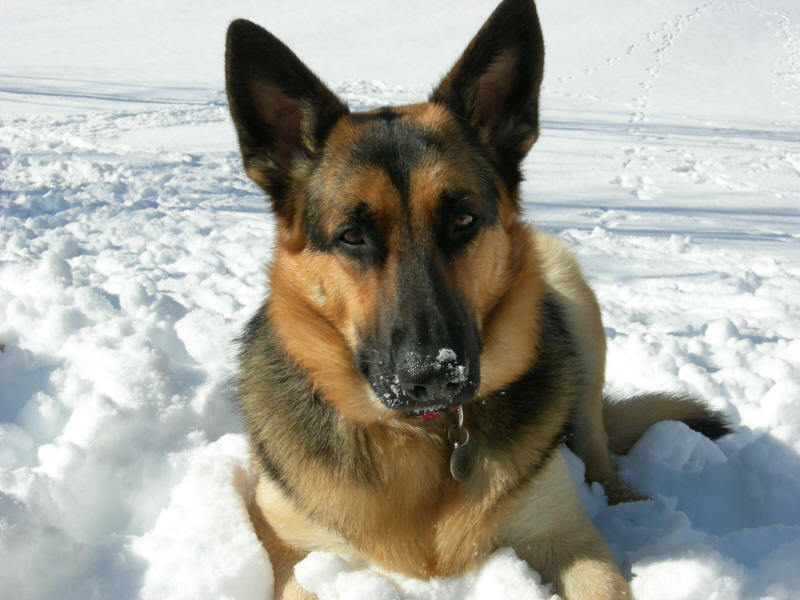 We have always had German shepherds and she has even managed to teach us many things on the breed. The kennels are beautiful and always in tip top shape. It looks more like a preschool yard then a kennel with the puppy play yard which is just too adorable. The grounds of her kennel are beautiful as you can see in the pictures on her webpage. I can say it is more beautiful in person and they are always trying to improve upon perfection. All of the kids get more attention then you would imagine of any breeder. 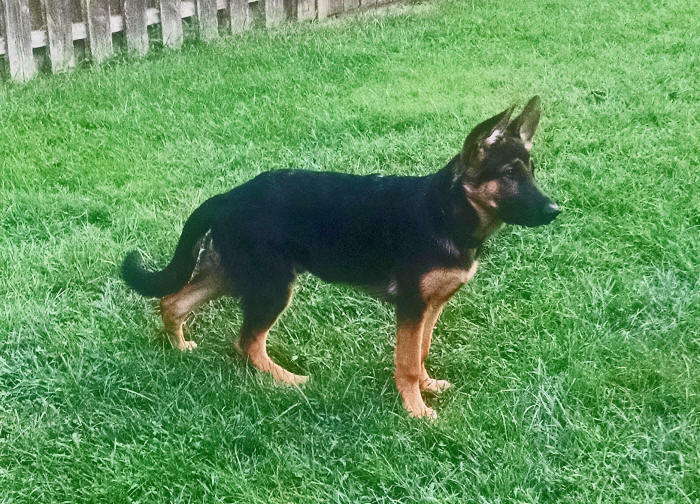 Her sheps are well socialized, mannered, and have such personality Our girl was not only well socialized but plenty spoiled by the time we picked her up. I could not imagine going to another breeder. It is obvious that Kellie loves every dog that graces her kennel. You will not find a more responsible, honest, and caring breeder. Many breeders we have researched just don't put so much of themselves into their kennels. We have already spoken with her about acquiring another baby from her in the near future. We've been so pleased with our girl Kaleigh that we're even considering two when we get into our new home! Kaleigh has been a blessing in our lives. She has always been healthy, happy, and willing to please. I couldn't ask for a better companion and watch dog. With her massive size she still manages to be the gentlest of girls. I have always been cautious of who I give references to and yet I have and will continue to refer people to the Mintern's kennel without hesitation. I am confident that anyone who chooses to bless themselves with a GSD from Mintern's will find themselves glad they did. Since we first met you in January 2005 when I was searching for a German Shepherd puppy for my Mother as a Mother's Day Gift, I knew you were more than just a typical breeder. The dogs you raise were your children, your life. You devoted and still devote your entire life to these dogs and it shows in Jack & Schatze. When I made the decision to buy a Shepherd for my Mother, I knew the kind of temperament that we wanted in a family pet but also the level of protection that we wanted, especially since my Mother is a victim of domestic violence. She needed both a companion and a protector and that's exactly what she got from Schatze, now nicknamed Missy Sunshine!! =) It also worked in the sense that the person who put the domestic violence on my Mom, my Dad, is totally afraid of Schatze and won't go near my Mom. That's exactly what I wanted to make sure happened since I can't always be around to watch and make sure things are ok on the home front. On to Jack...Kazan Jack is an interesting puppy to say the least! I say puppy because he is smaller than Schatze, but he still has a puppy face!! He LOVES to jump, my Mother has nicknamed her grandson The Gazelle because of how much he jumps! He's absolutely insane but so much fun! Jack was a Christmas present to me from my Mother so he is very special to me. He is anyways because he's my baby, in fact, I call him my son! =) We are so, so happy with the dogs we've gotten from you and will use you again to purchase another dog eventually. I may have to put Smokey, my newfie down (his allergies are now just beyond repair, he's now allergic to himself among everything else, it's so sad to watch) in the near future and am thinking about a long haired Shepherd. I already have names picked out too (just like a dog mom!! ), either Olivia Nicole (would be called Nicki) or Caspar if I went with a male. So, as you can see, our dogs are just more than dogs to us, they are a huge part of the family. They enjoy the Thanksgiving turkey (which I've had to start getting bigger w/them around! =) ), the Christmas ham, and Schatze even enjoys all the veggies!! She LOVES peas! Jack will eat anything and we try not to give them too many table scraps as they are on the holistic diet as is Smokey. One of their favorite things is to go to Thomas Tails, the holistic pet food store we shop at and go shopping for freezer bones, bags of dog food and of course all the treats they can get their little paws on! All we get are total complements about the dogs, how beautiful they are, and everyone asks us where we got them at. I have no hesitation in giving them your name and web address to check out your site and see if the dogs that you have might be a family member they are looking for. So, to put it in a nutshell...we LOVE our babies and will definitely be using Mintern's again! I have been meaning to send this but knew it would take me a few minutes so I just wanted to find the right time.. Please sit back a spell while I tell my story. 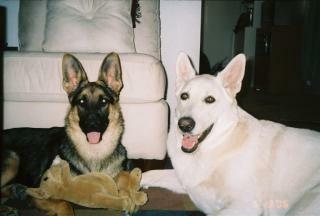 We were the proud owners of two German Shepherd girls....CHELSEA and HANNAH! CHELSEA a passed away very close to the age of 11. We were just heart broken! Both of my sons (14 & 21), my husband and myself cried when she passed away. So many, many memories there! I talked to Annette and told her what we were looking for. I was searching for FRAN-JO on the internet and found the Mintern Shepherds in regards to GIZMO. Gizmo and Mandie had just had a litter! We drove the three hour drive to Burghill to meet Kellie, family and dogs. WHAT A VISIT! I felt like I had known Kellie forever from that first meeting. What an INCREDIBLE person she is! We have always had girls and my boys wanted a boy this time. Of course, I had to think about it. Kellie was very instrumental in matching us up with our first male, MO-JO. The three week wait was the longest ever! We got to hold our little guy when he was three weeks old! Where can you go that you can meet not only the parents but also the grandparents, and even the great grand parent of your new pup? Kellie has just been the greatest when answering any of our questions. She has always been there for us from the start! MO-JO is just the most beautiful boy! He literally stops traffic! People want to know about him and I have given out Kellie's business cards to quite a few people! Mo-Jo is coated and just gorgeous. He was a fuzzy little thing when he was younger! He is highly intelligent, sweet, and just an INCREDIBLE member of our family. My husband calls him the "FABIO OF GERMAN SHEPHERDS"! Most people say, "WHAT A BEAUTIFUL SHEPHERD", when they meet him. WE LOVE HIM DEARLY! Loves to play ball and is WILD about a FRISBEE! We knew that when we got MO-JO that HANNAH would not be with us too much longer. We have always believed in having a pair as there is just something that another dog can give them that we can not. When CHELSEA passed away, HANNAH did not eat for a week! She adopted MO-JO as if he was her own even though she was an older dog never having any puppies of her own. MO-JO gave HANNAH the best last seven months of her life! After HANNAH passed away, we waited to find the new addition to our family. MANDIE had a litter with DIESEL. Kellie was extremely happy with the matching of JAZZY to our family. So were we! MO-JO was with us in the car on the trip up. He accepted her from the very first touch! And that reminds me....they are both great on car rides! What can I say about JAZZY? She is my sweet girl and my shadow! We just love her too! You should she these two when they go outside......side by side....looking at each other.....knowing they are gonna play and have a good time! We have been extremely happy with the OLD FASHIONED MINTERN GERMAN SHEPHERDS! 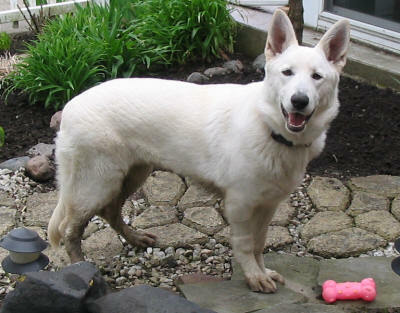 I would not hesitate for a second to go back to KELLIE for another GSD should the need arise. 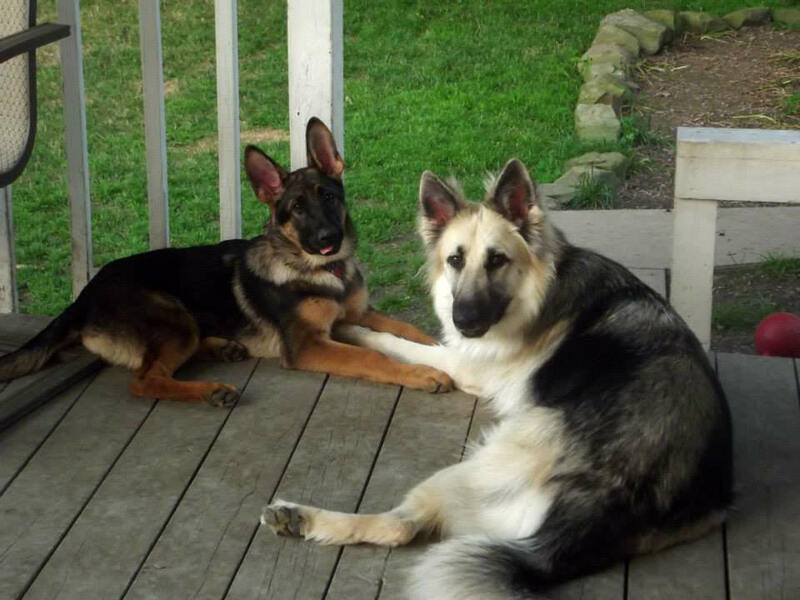 Her dogs are beautiful (have you every seen an ugly shepherd?) , loyal, and caring.......just incredible lines! GOD BLESS YOU KELLIE and FAMILY! OUR WARMEST REGARDS! Puppy mills have been in the news a lot lately, they are a soapbox upon which I could speak for hours. During the Westminster show, one always hears the importance of breed and breeder research. When one announces the pending arrival of a new puppy, the first question is what kind. The conversation continues along the superficial path. When an expectant human is asked about the pending child, she most always answers, "I don't care, I just want a healthy baby." Getting a health guarantee from a pet store or puppy mill is pretty much next to impossible. If you get one, the animal's guarantee ends with the first vet visit. Kellie breeds her dogs because to be quality pets, and provides a guarantee that she has no problem honoring. She wants to share her love and the love she knows her animals are capable of. Mintern's German Shepherds screams of responsibility, but you'll not hear it spoken, rather you will see it. You will see quality when you inquire about seeing her dogs, kennel or puppies. Kellie won't tell you to stop by any time. She will schedule a time that is convenient for you, respecting your time by wanting to provide her undivided attention. She will show you the puppy you are interested in, she may even place it in your arms. In the next breath, you will be introduced to the puppy's parents. They will be brought out to you so that you can inspect them, watch them and pet them. Did another dog catch your eye? Just ask - you'll either be brought into the kennel or the dog will be brought out to you. Important here is to point out that there are no restricted areas. Prospective parents are encouraged to leave nothing un-asked or unseen. Kellie's puppies leave the kennel, but never anyone's heart. A lot of work is put into matching the right puppy to the new parent's expectation. Even more amazing - If Kellie doesn't have a puppy that will match your expectations, she will let you know that. Leaving the kennel empty handed may be hard, but knowing that permanent placement is one of her values cultivate that much more respect and admiration. I could continue on the path of praise, it's quite easy. My pup is from Koda & Buddy's litter in 2005. Sadie has exceeded every expectation I had and expressed to Kellie. Sadie's smarter than I ever imagined. When she's been at her new home for two days and sits in front of the sink when her water bowl is empty, you know you're going to have one smart cookie on your hands. I am very blessed to have Kellie in my life. She's entrusted me with one of her most beloved boys also, for that I will always be grateful, He'll always be yours Kellie, you're just letting me feed him. You may find what you think is fancier, you may find pups that are more expensive, with the internet you will always be able to find multiples of what you are looking for, You'll only find one Kellie Mintern, and she's always just a phone call or email away. that we just purchased another puppy over Easter weekend. pup in her spring liters. her life, and I get compliments constantly from strangers on what a beautiful shepherd. I cannot say enough about how nice Kellie has treated my wife and I.
I would definitely go to Mintern's again, provided she would sell to me again. telephone calls while we still lived in Florida. 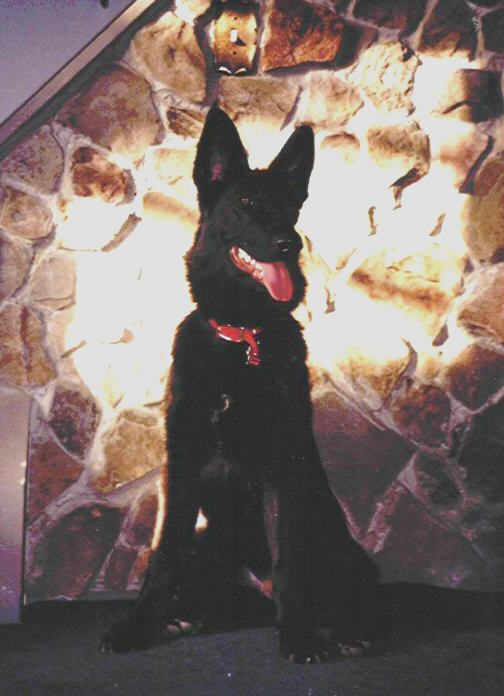 I lost my first ever beloved GSD in October '05. It felt like my world was ending. leading to our big move. really tell how much she loves her kids & what she does. She is 110% devoted. Words can't fully describe the love of a good GSD. 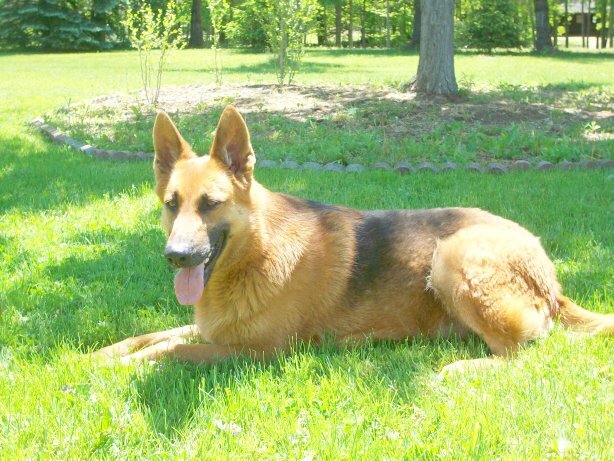 For those of you looking for a purebred german shepherd from Mintern's German Shepherds, you have come to the right place. Kellie and Paren are absolutely the best breeders I have ever met. When Kellie states that you have her for life, she really means it. I purchased our pup from her a year ago and have asked numerous questions, had concerns, etc. and she is so helpful. I didn't know much about German Shepherds. All I knew was that I wanted a was a male, large, good family dog, that would be mine (follow me even if my husband was home). I guess you would call it a mama's dog. I wanted a dog that would be sweet yet protect us and our home. She was able to match our needs and our personality to our dog Czar who is the best friend anyone could ever ask for. I don't know what I would do without him. Czar has even been back to Kellie and Paren's to board while we are away on vacation. I didn't even have to worry if he was going to be o.k., since it was one of Kellie's pups I knew she would take good care of him. She loves to see her pups come back and visit even if it is to pick up a bag of dog food or treats from her. I can't say enough about the Mintern's. They have had people come back time and time again to be matched up with another pup or adopt one of their adult dogs to add to their family. You can tell by their home and kennels that these dogs are well loved and taken care of. 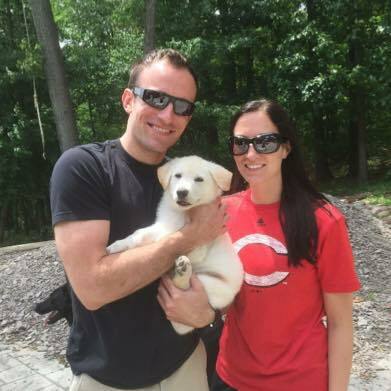 It is Kellie's passion to make sure every pup that is selected will have a "Forever Home". That's what you get when you purchase a dog from the Mintern's a family member for life. 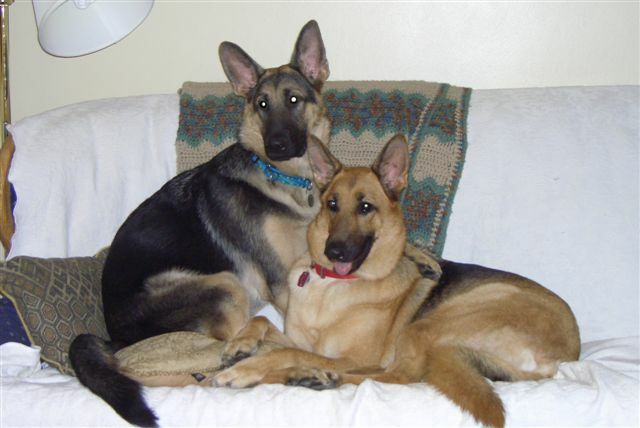 When looking for another GSD I searched the internet and quickly found Mintern's German Shepherds. I checked the site and emailed the Mintern's and was quite impressed with the information they shared with me about their GSD "family". We visited the kennel and found that their kennel was the nicest places we have ever seen. 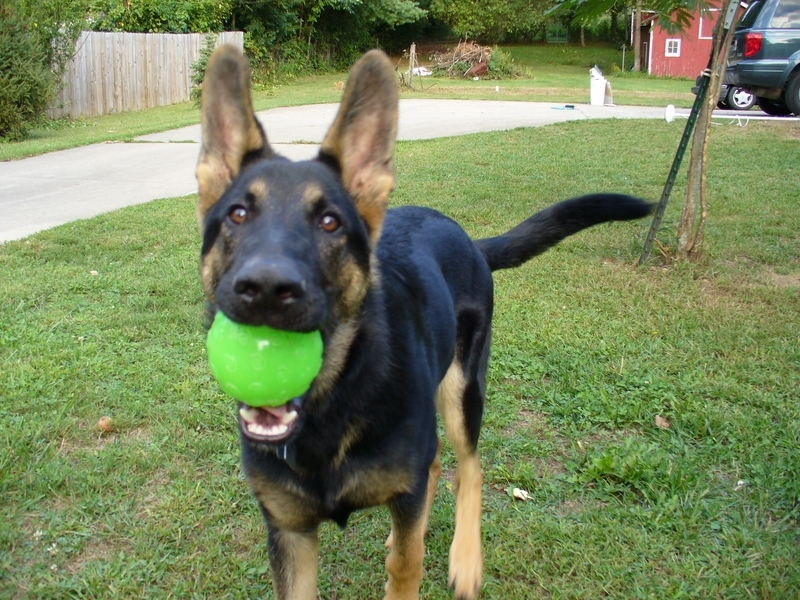 The Mintern's raise quality German Shepherds with love and compassion for all of their dogs and puppies and are sure to give you all the information you need in acquiring a new puppy. We went back in May of 2005 and purchased a female we named Abby. She is a wonderful girl from Cherokee and Gizmo lines. In the fall we went back and purchased another wonderful female from Miss Polly and Gizmo that we named Lilly. 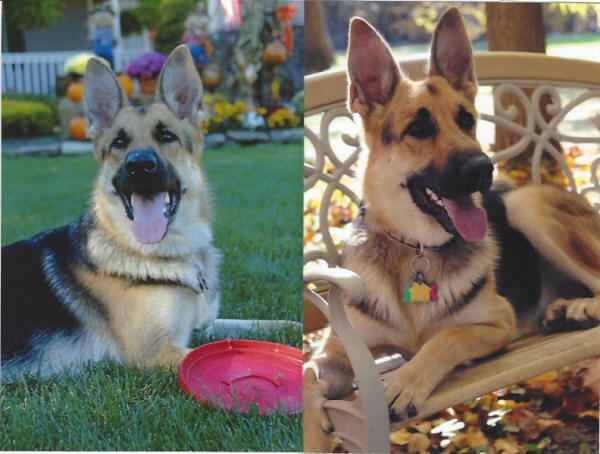 You not only gain a family member of German Shepherds, you gain a wonderful "friend for life" in Kellie and Paren Mintern. This family is the most caring and compassionate family we have ever met. They make sure they let you know all the information needed in raising a puppy. They raise healthy puppies with great pedigrees. Their website is full of information and photos of all the dogs and puppies and each puppy's personality is even listed so as to place the puppy in the appropriate home. It takes a special person to spend so much time with each puppy to know every little detail and you find that in Kellie. 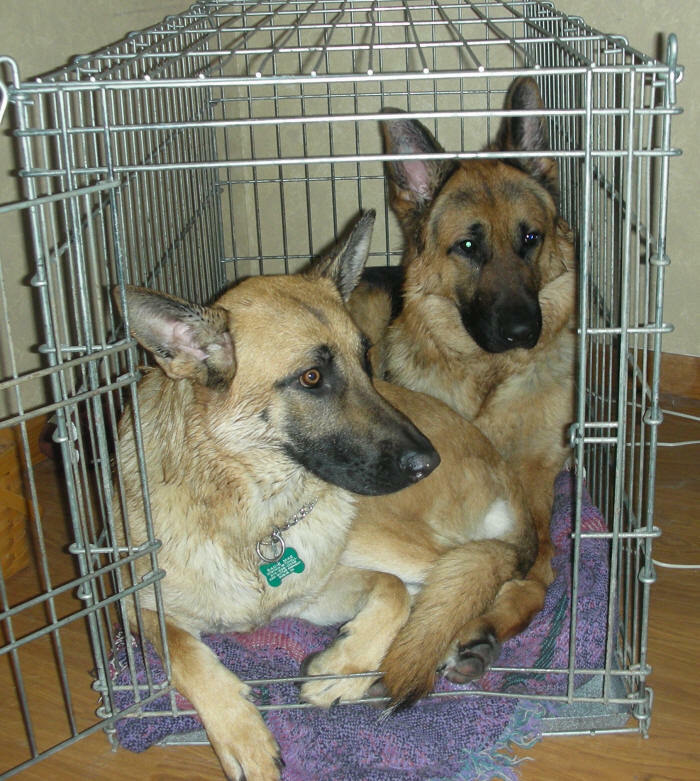 My two German Shepherds even go back to visit and stay at the kennel while we are on vacation. We feel very fortunate to have found these wonderful people to have to share our love for the breed and to care so much about what they do. Mintern's German Shepherd's come highly recommended by our family. My name is Miss Lilly Grimm! My Mom and Dad are friends with Kellie and Paren and I came to Woodsfield Ohio to live with my half sister Princess Abby and Chris and Marsha! I have been a very busy girl growing up really fast with my sister and exploring everything around our house! I love to play and run and unfortunately I hurt my elbows cause I jump and run so much and I have to have surgery in January. My Mom and Dad say I will be as good as new and the Doctors at Ohio State Veterinary Hospital will take very good care of me! I will be fine and ready to play as soon as I heal! When I am tired and since I was just a little girl I have to have my "Baby". Kellie and Paren say that they have never had a shepherd do this so I get to be the first!! I get tired and get my "baby" and I nurse on it and pump my feet like a little baby is nursing, and I am 16 months old!! Isn't that funny!! I am a very special girl and so different from my big sister Abby. Abby is a very laid back shepherd but she likes to play with me! My Mom Marsha is sending a photo of me and my Baby but I am resting with it in my mouth! I hope all the other shepherds from my other Mom Kellie's house have as good of a home as I do. My Mom and Dad always take the best of care of me and Abby and we are very lucky girls. Kellie and Paren have always cared about us since we left their house and moved to Woodsfield. Abby and I love them very much and wanted to share my funny story with everyone! My Mom says to thank Kellie and Paren for being special friends and for loving and caring so much for us! Especially me!! Thanks for the chance to tell about my baby which is falling apart but my Mom Marsha keeps sewing it up!! 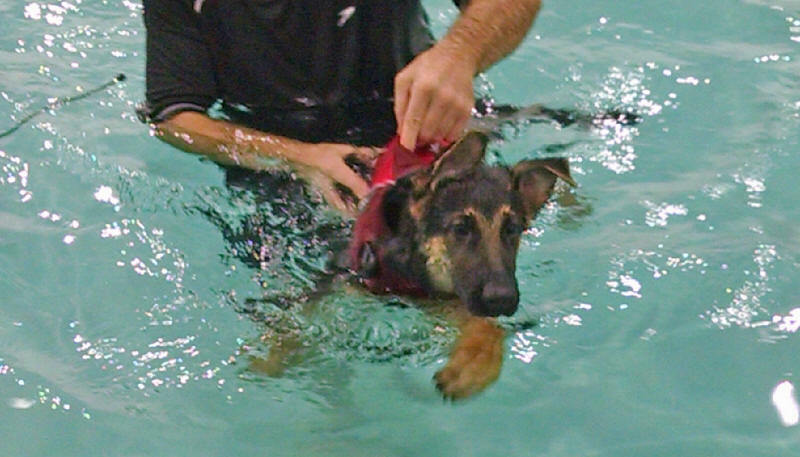 Hello to all the German Shepherd Lovers that read this story! My name is Princess Abby Grimm! I am the big sister to Miss Lilly that was the first to be on Mom Kellie's website for Sable Sadie Says! That's OK. I don't mind that I wasn't first! My Mom and Dad are Chris and Marsha but my first Mom is Mom Kellie! I love her so much, and Paren too! We got to stay at their house when my Mom and Dad went on vacation. We are good friends and we don't usually play with my sister Lilly. I came to live in Woodsfield, Ohio with Chris and Marsha in June of 2005. My Mom retired from work and was home all the time to be with me. I don't do anything as silly as my sister but I love to play with toys and I don't tear them up. I love to squeak them! Glow balls are my favorite toy! I have always been a good girl. I have stayed in the house by myself since I was 4 months old and my sister and I have never destroyed anything like shoes or things that belong to my Mom and Dad. I am a very friendly girl and I love everyone, especially Mom Kellie and Paren. I am so lucky to have a good Mom and Dad that take very good care of me all the time. Well, that's my story! I just like to be outside and play! Thanks to everyone who reads my story. Thanks to Kellie for letting me come to live with Chris and Marsha! My name is Capone Von Gangsta, but you can call me Capone! I live with my Mom, Tami, in Warren and am extremely spoiled! My birth parents are Sylvia and Redhawk; I will be 2 on April 29th and still have a lot of puppy left in me. My Mom is a school counselor and has decided that I have ADHD, ODD and possibly some Autistic tendencies . . . I am always on the go and rarely sit still; sometimes I choose to be stubborn and not listen; and I often do not feel like being a social butterfly. I am very nosy and like to be aware of everything that is going on in the neighborhood. I will sit in the drive for long periods of time just watching the street. If I see something that I do not like (which can be people or objects), you better believe I let them know about it!! My Mom and Grandparents say I was a gift to house train . . . I only had one accident in the house and that was the first day I came to live in Warren. I was 6 weeks old when I left the Mintern's and joined the Mazzella family. My Mom was home for the summer and I stayed by her side for 10 weeks straight before she had to go back to work. We did everything together . . . and she wonders why I have to be everywhere she is now-a-days!! When the weather is too bad for me to be outside when my Mom is gone, I get to go to "Daddy Doggy Daycare," which is at my Grandpa's house in Cortland. I have a house in the garage with a doggy door to my outside pen and I love all sorts of weather, but it is just fun going to Papa's!! (I told you I was spoiled!!!!) My Grammy gives me yummy treats all of the time, too, and I even have a neighbor known as the 'cookie lady' because she feeds me cookies . . . I have my very own bag at her house! Can you say SPOILED!!!! THANK YOU~ everyone for stopping by to read some of our Reference Letters.....We love all our puppies and we love all those who have given them incredible HOMES! From the bottom of our hearts we THANK YOU!! God Bless! !